The skiing and riding should be epic today here at Timberline. Don't let the warm weather fool you, we have been salting nightly. Spring skiing and riding is awesome! Grab your gear, come on up and enjoy. Not ready to put away the skis or snowboard yet? Don't do it! At Timberline you can ski or ride all spring, and summer too! We are ready for it!" is the slogan of Garmisch-Partenkirchen’s candidature to host the FIS Alpine World Ski Championships in 2011. And they are more than willing to prove it. The 2011 FIS Alpine World Ski Championships in Garmisch-Partenkirchen promises to be a celebration of sports for all nations, for the youth and adults alike. The German hopefuls Maria Riesch and Felix Neureuther support the application with all their heart and soul: "We are convinced that the FIS Alpine World Ski Championships in Garmisch-Partenkirchen in 2011 would increase the popularity of ski sports enormously, even far beyond the German borders." Rosi Mittermaier and Christian Neureuther also support the application with deep conviction: "There is hardly any other place that fantastically combines nearly perfect infrastructure and top level conditions for World Championships." Garmisch-Partenkirchen and its wonderful landscape have enthralled the fans of alpine skiing for generations. Fantastic runs encourage world class athletes to strive for new achievements. The races down the "Kandahar" are legendary and the slalom races at "Gudiberg" push athletes to their limits. The ski circus already meets at annual FIS World Cup races in the county of Werdenfels - a good reason to confer the 2011 FIS Alpine World Championships to Garmisch-Partenkirchen, to the region, to the whole of Germany. We are ready for it! Welcome to the new facilities at Holmenkollen in 2011! Five years from now Oslo, the capital of Norway, is prepared to host the FIS World Ski Championships in the Nordic disciplines. The venue will be the famous Holmenkollen, where new facilities will be built to meet the demands of the future. The old jumping hill will be dismantled and replaced by modern facilities. The Cross-Country stadium and courses will be upgraded as well. The famous jumping hill at Holmenkollen has been extended 18 times. The new facilities there will include: • A less steep inrun with a freezing capacity • Reconstruction of the lower part, from the jump until the end of the outrun • New grand stands for spectators • Better working conditions for the media • New facilities for competition management, including jury and judges, media, coaches and athletes • New lift • New floodlight system • Permanent wind protection measures However, the architectural fingerprint of the old hill will be retained in order to maintain the famous Oslo skyline! Schladming’s candidature for the FIS Alpine World Ski Championships in 2011 is based on a concept of the championships as a festival of sport – a celebration of sport in honor of young people from all over the world. Schladming sees itself as an organizer of events ranging from the support of young local athletes with appropriate infrastructure to staging large-scale, international competitions. Schladming’s experience as organizer is second to none: in addition to the FIS Alpine World Ski Championships in 1982, the FIS Junior Alpine World Ski Championships in 1997 and 29 FIS World Cup events since 1973, Schladming served as the venue of the 1993 Special Olympics World Winter Games: a true proof of the open-mindedness and philanthropic attitude of the local organizations and institutions and also known as Schladming’s credo. Schladming’s philosophy of international encounters is also reflected in the annual culture festivals featuring a symbiosis of rich Austrian musical tradition and international colors. Sport, culture and nature are the main ingredients of Schladming’s event concept. At the same time, Schladming promises to stage the championships of extremely short ways with stadiums right in the town center! Add to that the legendary Schladming FIS World Cup Night Slalom atmosphere with up to 45,000 spectators and you have the perfect conditions for successful FIS Alpine World Ski Championships in 2011. The next skiing season will start on November 25th, 2006 and will close on April 15th, 2007. High season: from December 24th to January 6th and from February 4th to March 17th. 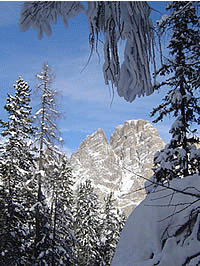 Available on the Website the new Skipass price lists: Valley Skipass and Dolomiti Superski. PARK CITY (May 13) - Financier Peter Kellogg of Short Hills, N.J., a longtime board member of the U.S. Ski and Snowboard Association and a driving force in its drive to create a legacy endowment, was named Friday night as winner of the Julius Blegen Award, USSA's highest honor for volunteer service to the 101-year-old federation. In addition, the Beck International Award - USSA's highest athlete honor - was given to Olympic champion Ted Ligety (Park City, UT). The Westhaven Award, given annually to recognize the work of an "outstanding" technical delegate (who overseas a competition), was presented to Bob Dart, longtime alpine race organizer and competition official from Winter Park Resort in Colorado. Bud Keene, whose freestyle snowboarders earned six Olympic medals - including three golds - in Italy in February, was honored as Coach of the Year with Glenn Eddy, freestyle program manager and head coach at Maine's Carrabassett Valley Academy, selected as Domestic Coach of the Year. The USSA Club of the Year, spotlighting a club, which is "providing direction to young athletes through high-level competition programs" leading to elite success, is Waterville Valley (NH). The USSA Congress 2006 has attracted more than 200 delegates with committee and subcommittee meetings through Sunday. Kellogg was cited for his ongoing generosity and his "exemplary leadership" in motivating others to contributing to USSA and the U.S. Ski and Snowboard Foundation. Ligety, 21, captured the Olympic gold medal in alpine combined - the first won by an American - as he produced the fastest slalom runs. After the Games, he collected his first World Cup victory, winning a giant slalom in YongPyong, South Korea. He finished his season with two more gold medals at the TD Banknorth U.S. Alpine Championships, defending his titles for slalom and combined. Keene, who retired as U.S. halfpipe head coach as the season ended, directed the halfpipe riders for the past four years. U.S. riders won gold and silver medals in both the Olympic men's and women's contests - and also were fourth in each event. Eddy was cited not only for his work at CVA but for being a Junior World Championships coach, chairman of the USSA Coaches Subcommittee, and longtime involvement in freestyle officiating. The Westhaven Award, honoring outstanding service as a technical delegate, was given to Bob Dart, head of the Winter Park (CO) Competition Center for 20-plus years, current chair of the USSA Alpine Committee and NorAm Cup Committee, an alpine TD for more than two decades and president of the Rocky Mountain Division board for 12 years. He was the TD at the 2005 World Alpine Ski Championships in Bormio, Italy. Alpine - Squaw Valley (CA) Ski Team; Cross Country - Sun Valley SEF; Freestyle - Wasatch Freestyle Foundation (UT); Snowboard - Waterville Valley. The five Olympic and five Paralympic gold medalists plus the U.S. Snowboarding staff received USSA Chairman Special Recognition Awards. Steve Cook (Salt Lake City), cross country standing 5K and 10K; Laurie Stephens (Wenham, MA), women’s sit-ski downhill and super G; Kevin Bramble (Truckee, CA), men’s sit-ski DH; Allison Jones (Colorado Springs, CO), women’s standing slalom; Stephani Victor (Park City, UT), women’s sit-ski slalom. U.S. Snowboarding was awarded the special honor for earning seven Olympic medals, including three golds in Torino this past February. Paul Bacon Award (contribution in race organization) - Jeff Pickering and Big Mountain (MT) organizing committee; John J. Clair Jr. Award (outstanding service benefiting U.S. ski or snowboard teams) - Harry Stoneham of Eastern Amateur Ski Education Foundation; Bud and Mary Little Award (long-term involvement in FIS or Olympic sport communities) - Tom Winters; Buddy Werner Award (leadership and sportsmanship in national or international competition) - Lindsey Kildow (Vail, CO); West Family Cup (outstanding service) - Tim “Swampy” LaMarche, longtime U.S. alpine coach and race official; Russell Wilder Award (outstanding efforts with American youth) - Nick Preston of Waterville Valley; Al Merrill Nordic Award (outstanding commitment, leadership and devotion to nordic excellence) - Lee Todd; Mike Jacoby Cup Award (outstanding performance in international snowboard competition) - Olympic champion Seth Wescott (Kingfield, ME); Anna McIntyre Citation (distinguished achievement in advancing snowboarding) - Tim Windell; Burckett-Dodge Award (outstanding contribution to alpine officiating) - Ted Sutton.